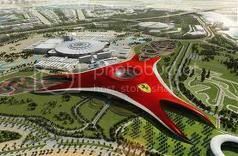 Ferrari World Abu Dhabi, the world’s largest indoor theme park and the world’s first Ferrari theme park, will open to the public on Wednesday October 27, a day earlier than planned. Announced as ‘an intense multi-sensory experience and a must-visit for enthusiasts, fans and families’. The park pays tribute to the passion, excellence, performance, technical innovation that ferrari has established over the years and represents today. The red roof of the park is a direct take off from the iconic double curve of the Ferrari GT body – and spans 200,000 square metres. 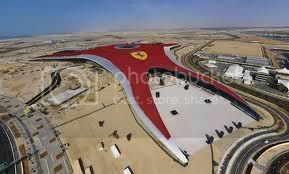 Emblazoned on it is a sight that any Ferrari lover would kill to get a look at – the biggest Ferrari logo ever made. 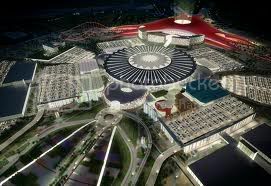 The autocentric theme park, next to the Yas Marina Circuit racetrack, will offer more than 20 action-packed attractions. Sure to be a big draw is the Formula Rossa (red) roller coaster, which the park claims will be the fastest in the world, with carts inspired by F1 race cars reaching grand prix-worthy speeds of 149 miles per hour. A flume-type water ride, meanwhile, passes through a supersize Ferrari 599 V12 engine. Standard tickets cost 225 United Arab Emirate Dirhams (about $61) for adults, and 165 AED (about $45) for children. Premium tickets, which provide access to an exclusive lounge with refreshments as well as other as-yet unannounced benefits, cost 375 AED (about $102) for adult or 270 AED ($74) for more diminutive Ferrari aficionados. Both ticket levels provide unlimited access to all rides and attractions. The park will be operating on a six-day a week schedule from Tuesday to Sunday, from 12 noon each day. Formula Rossa – The world’s fastest roller coaster, reaching speeds of 240 kph. V12 – An exciting flume ride to the heart of a 12-cylinder engine. Bell’ Italia – A miniature recreation of Italy’s most famous locations, from the picturesque Portofino and the Amalfi Coast to Monza racetrack, the Colosseum in Roma, Venezia and Maranello, the heartland and home of Ferrari. Cinema Maranello – Ferrari World’s own theatre showing ‘Coppa di Sicilia,’ a short film that tells one of the many inspiring stories from the life of the legendary Enzo Ferrari. 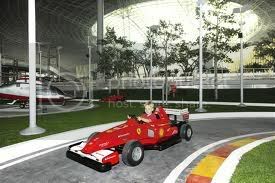 Junior Training Camp – An interactive play area for children where they can engage with a waterless car wash, become custom ‘constructors,’ climb up the grandstand, pilot remote cars, peddle their own miniature Ferrari and play with an F1 car made of soft, guest-friendly foam.